A web-application for trade on Forex and Digital contracts without installing any software. Web-terminal works directly from your internet-browser window. MetaTrader4 – is an advanced trading and analytical technology, as also a variety of additional services. Everything that you need for trade on Forex and Digital contracts can be found in this trading platform. Traders that use, perhaps the most popular platform for MetaTrader 4, can now trade Digital contracts with the innovative FX LITE solution. The WebTrader platform is designed in such a way that it is easy to understand the first attempt at account management and platform settings. Webtrader is indispensable for experienced stock exchange players, thanks to technical analysis tools, one-click trading and high speed trading requests processing. All functions of the MT4 you are familiar with: basic types of graphs, one-click trade, a basic set of analytical tools. Trade from any operating system with a pre-installed browser, including WinMobile! Possibility of complex account management from several devices. Without a doubt, this is the best alternative to MT4. Simple and easy to use multilanguage interface. WebTrader. Ideal for all devices. World Forex takes care of the comfort of our customers, and that's why we provided you with a platform with which you can not only earn with ease on almost any device, but you will always be aware of all market events! Technical analysis, facilitated search by symbol, trade history, open positions - all this will provide you with excellent information about the current state of affairs. Do not forget also that three different types of graphics will satisfy the needs of any, even the most demanding trader. World Forex Web Trader is a direct and fast access to the Forex market from any device: PC, tablet or smartphone. Mobility and speed are the main characteristics of the platform. Comfort and safety of managing your personal capital at any time and place convenient for you! Meta Trader 4 is indispensable for experienced exchange players, thanks to technical analysis tools, one-click trading and high speed trading requests processing. It is one of the best trading platforms in the world, for trading and analysis of financial markets. A wide range of mobile versions allows traders to track and make trade decisions most quickly on the go, using a smartphone or tablet computer. The most convenient and understandable interface of the platform allows you to master the entire functionality of the platform without much difficulty. METATRADER4. An optimum solution for everyone. The trading-analytical system MetaTrader4 allows you to realize trading strategies of any complexity. Analytical functions of the platform are the powerful instruments in trade. Over 20 analytical objects and about 30 already in-built technical indicators considerably help while planning of a trading strategy and facilitate to quickly and efficiently respond to any market situation. Managing trading orders from the graphics, various modes of execution, trailing-stop and other functionalities of the trading platform – everything at your disposal! 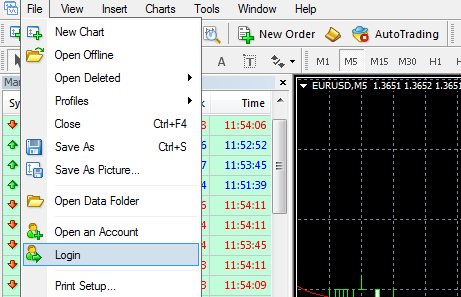 MetaTrader4 trading terminal for trading on Forex, Digital contracts, and analysis of financial markets. A plugin that allows you to trade Digital contracts. Requires installation of .NET 4.5 which is provided with the plugin. TRADING PLATFORMS FOR ALL DEVICES! We provide a wide range of trading platforms for all modern devices. Millions of traders with different needs choose MetaTrader4 for carrying out trading operations on the market. Regardless of the level of competence, the platform offers traders the most powerful capabilities: the enhanced technical analysis, flexible trading system, algorithmic trading and trading advisors, as well as applications for mobile trading. Web-platform WebTrader – is an ideal solution for any trader who wishes to receive and use the same possibilities in trade that terminal MetaTrader4 offers, but without installing any software on his/her device. This platform allows receiving an access to a trading account by just several clicks! * To obtain a digital IP address, contact technical support or use the online chat to contact the operator. For authorization, perform a command ‘Login” of the account shortcut menu (right mouse click on the account number) in the “Navigator” window or the “File” menu. Then in the dialog box should indicate the number of accounts, one of his passwords (standard or investor) and select a server. After providing the information, press the "Login" button. When all the data, click "Login". Recommended to put a tick in the box "Keep personal information." In this case, during the startup of the terminal, a login window, all authorized accounts will be displayed automatically. In the "Login" field – account number. 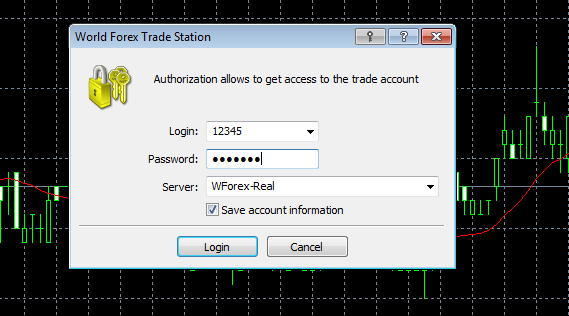 Wforex-Real is a server for real trading accounts. Wforex-Demo is a server for work on demonstrative and competition accounts. When carry over the password, we recommend to use the option of copy and paste to avoid possible false interpreting of some complicated symbols (for example, 'i j' , 'q g' , 'h n' ) in case of a manual letter-by-letter input. Important! If you do not activate the option “Save personal settings and data upon startup” in the settings window, your password will not be saved when closing the terminal and at the second login, you will have to input it again. Therefore copy and/or keep the trading account data in a secure place, in case you do not use this option.